Cryptocurrencies are looking to gain more attention in the new year 2019, and this is because the decentralized means of payment is proving to be better than our usual centralized banking methods. Though in the past lots of governmental bodies and banks were against cryptocurrencies as they say it is used for criminal activities and needs to be regulated, but the truth is what currency is not used for criminal activities? In our world today everything that has an advantage also has its own disadvantage. The important thing is does the merits outshine the demerits? When this happen one can see reasons to make use of whatever it is . This is the same way it works with cryptocurrency, the merit of cryptocurrency and decentralization doesn’t just favour a few, instead it favours majority of the people . Due to the presence of extreme transparency there is a limit to what can be hidden from the blockchain . Cryptocurrency is never complete without platforms that helps it maintain, rise or diminish in value, this platforms are known as exchanges. A cryptoexchange is where the value of a cryptocurrency is seen, on a crypto exchange people bargain for the price in which they are willing to buy or sell, the force of demand and supply keep battling until both of them reach a point of agreement . That point of agreement is what we know as the price or value . Come 2019 I believe good exchanges will look to right the wrongs that gave them issues in the year 2018. Crypto traders generally know there are two types of crypto exchanges, or let me say two major types, and this are the CEX(centralized) and DEX(decentralized) crypto exchanges. Both these exchanges have their strong points and weak ends but I would like to talk mainly about what is good for cryptocurrency . Cryptocurrency was created to be a completely decentralized means of making payments, running transactions to both to be user both onchain and offchain. So many cryptocurrencies came about with their decentralized solution to various centralized markets with issues due to centralization. Now, if we aim to completely decentralize our way of living and remove the power to makes moves from the few hands enjoying from centralized mode of transactions we must also do so in our crypto exchanges. Centralized crypto exchanges are good, do not get me wrong but I believe the goal is to completely decentralize and give everyone equal chances. For this reason I would love to see a new dawn where decentralized exchange platforms get all the attention it deserves from traders. Deex is a decentralized platform which provides individuals a reliable and convenient way to quickly trade, buy or sell cryptocurrencies with help of the most popular payment methods for the fiat currencies available in the country of his/her residence. Deex decentralized ecosystem is based on the BitShares 2.0 platform. The goal is to create a platform that replicates the features and functionalities of centralized exchanges without their major shortcomings, including security threats, unfair competition, dangers of sanctions, political factors, and more. BitShares 2.0 allows for 100,000 transactions, for example. It also allows for the creation of smart contracts. Today’s centralized exchanges, for example, are exposed to a number of risks like security threats, unfair competition, danger of sanctions, and more. These exchanges keep all customer funds and data in a single, centralized place, creating a major security threat. Over $500 million in cryptocurrencies has been stolen from centralized exchanges to date. Modern user interface that can be used in all modern browsers. Mobile app for iOS and Android and a desktop application for the computer. Tecnical support to users 24/7. Referral program, where you can invite friends and family and earn an extra pocket money. A decentralized, transparent blockchain fund called the Deex.fund. Hardware cryptowallet support for cold storage of cryptocurrencies and tokens. Trading robots for automatic trading. A platform where companies can safely conduct ICOs with the decentralized escrow toolkit from Descrow.org. Cryptocurrency debit cards linked to users’ wallets on Deex for integration into fiat gateways. An API for the integration of third party applications and services within the Deex platform. A network of crypto ATMs where users can exchange fiat currency for cryptocurrency in the real world. 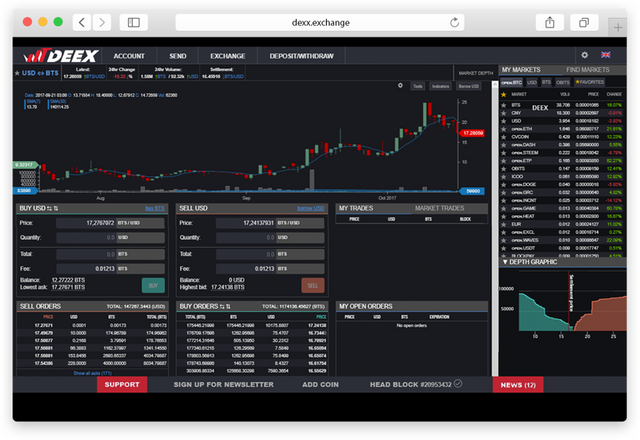 Deex intends to create a fully decentralized exchange that can be easily used by the novice user, but also offers everything for the experienced trader. Decentralized means that there is no central authority behind or in between that determines everything and charges high fees. Something we need cryptotraders! The platform is completely decentralized and everything is visible and transparent on the blockchain. The team behind Deex has big plans for the exchange and has described all this in the whitepaper. There will be a special debit card that is linked to your Deex account and a private network of crypto payment terminals will be created. The long-term goal of Deex is to create an entire decentralized financial ecosystem. Delegated Proof-of-Stake Consensus (DPOS) – Delegated proof of participation. At the first stage of development, we want to create a reliable, convenient and multifunctional cryptocurrency decentralized exchange (on the Platform Bitshares 2.0 with the integration of full functionality of Openledger exchange and other analogs of DEX-exchanges). At the time of the ICO, DEEX there will be an MVP of the exchange and will be traded.  Creation of own agent network of crypto maps on purchase and sale of cryptocurrency for Fiat with the possibility to work with bank cards. According to one of the founders of the project Deex Exchange, Vlad Sapznikov, co-founder of the company Preprocessing LTD: “The prerequisite is phased financing. The meaning of which is that the administration does not receive all the amount of money at once, but only a part of it, after which it conducts its activity, returning the promised sums to investors and reporting to them, only then passes to the next stage “. The benefits that Deex provides can be compared to centralized exchangers, with the only difference being that they have managed to offset their shortcomings, such as the risk of sanctions, political instability, unfair competition, and so on. We would like to note the highest level of protection. Instead of security threats, users will gain the full confidence provided by the Bitshares 2.0 platform (also known as Graphene). It is an incredibly fast and reliable system, which from the moment of its creation and still does not contain any record of hacking. DEEX According to forecasts, by the 2019 year Deex will become a full-fledged player of the cryptographic world, widely known as a reliable company, uniting the popular crypto exchange (access to which is easy to get through the smartphone), convenient P2P-messenger, network ATMs, own cryptocurrency cards, a platform for ICO. The company has a bounty-program, presented in all social networks. Vladislav Sapozhnikov, who has a firm academic background in finance and banking. Other team members are Peter Grubber, Konstantin Pomaskov, and Timofei Ra. Yuri Milyukov who is the founder of Inkombank and also the chairman of the exchange committee of the Moscow Commodity Exchange. Victor Ageyev, Denis Soldatov, and Andrey Voronkov.